We're in the car heading home, and my three-year-old daughter Eloise asks, "Mom, what is God?" Another night, just before sleep, she asks, "Mom, will I still be Eloise when I die?" And on another afternoon when we're about to read a story, she asks, "What is time?" All my answers to these probing questions are but feeble guesses. So often in motherhood, we are faced with mysteries so much larger than our capacity to understand, and yet we try to explain these mysteries―death, time, the divine―to our children as best we can. We conjecture; we talk about “what if”; we touch on what we do know and make gestures towards what we don’t. In three recent poetry collections, three writers also wrestle with and guess at the mysterious and the unknowable in both powerful and provocative ways. And yet like my own answers to Eloise when she asks me impossible questions, these poets also remain speculative. by the hors d'oeuvres. "Hey," I say. "Hey. I should probably give this nice star back." Here, Skolfield is in essence asking, "what if? ", expressing in a breezy way the weird surprise so many new mothers feel: "This new thing isn't quite human or really mine, is it?" And in Skolfield's collection, her poems imagine "what if" again and again. What if knowing the word "homunculus" meant you controlled a little civilization? What if life here on Earth was more like life on a paper mâché planet? What if we take the skeleton in "skeleton key" seriously as a key to unlock the body? While Skolfield's tone and subjects darken in the middle and last sections of her book, her method includes thought experiments throughout: What if "that sound under the car" is made by some kids she ran over? What if instead of her mother dying, she's "just forgotten / to call for four years" and imagined the funeral? What if adults were like toddlers; what if we humans could envy the effects of head injuries? What if this scar on Skolfield's palm becomes her future? Knowing through exploration can bring Skolfield's readers to a discomforting brink, but it's far better than "look[ing] the other way," as the mother in the poem "Cherries" who says nothing about her husband's crimes: "She knew / she must have known, that he / had raped at least one niece, / granddaughters, the daughters of visiting / missionaries returned from the field." 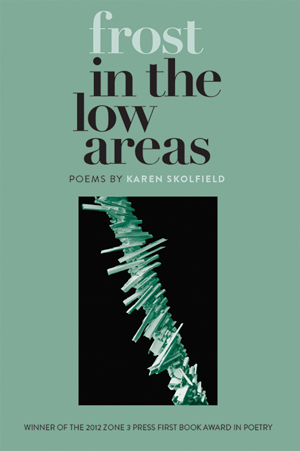 Ultimately, Skolfield's poems ask whether we can hold on to anything or anyone. To understand desire and love and what threatens both, a person knows not by holding on but by the letting go necessary to explore and to reconnect. As Skolfield writes, "something forgotten" is not necessarily gone but "may one day / walk out of the woods." And recognizing "how we live in the unlost" means the default condition is to be lost and guessing—but not alone. Skolfield's default condition provides the impulse for Katie Ford's Blood Lyrics and Nicole Rollender's Bone of My Bone. Both Ford and Rollender struggle to make sense of the great unknown of death. Both draw upon incantation and ritual, calling upon and crying out against God. That said, however, their approaches also slide toward opposite ends of the formal spectrum. Whereas Rollender's poems enact questioning through disjointed, associative leaps, Ford's are clear, measured, and direct. Both approaches are effective. Nicole Rollender's chapbook, Bone of My Bone, is peopled by the dead. These citizens are but one thread that ties the book together. Rollender also draws from the Benedictine daily cycle of prayers, the Divine Office, for four of her poem's titles, and she repeatedly incorporates in her writing the women who came before her, the body torn or taken apart, and the relics and language of Catholic devotion. In this devotion to memory, the body isn't sacred; it just provides ingredients for a potion that makes what's greater, that "last open into brilliance." With this poem, readers see Rollender’s characteristic approach. She makes her thread and then from it leaps and turns. For example, in "Lauds," she writes: "Let the wolves within me say their names. These hands, furrow. / Let asps crawl / into logs. Let this river be saved." Need calls out its incantation and yet does so in a series of images that cause readers to experience need's disorientation. Then, Rollender's poem turns from a position of supplication to a kind of power: "I cry for you, God, who has no / hands or feet on earth anymore." If day starts this way, and this day is life writ large, then humans' lives are struggles to understand life itself―to make meaning. Throughout, Rollender peels apart the body to probe what we humans are and where we're headed. In "The Preparation of the Body," she writes, "We'd have to break metacarpals and phalanges / to separate your hand from the waves / and the stones." In "Disassembling," she remembers pulling moths apart and asks, "Was there an opening the illumined moth / slipped through? Or, did it sink / to be eaten?" while his waters shake through me. In these lines, Rollender dramatizes the terror experienced in the body as a chaotic storm of wind and water but in the mind as a fearful imagining. Her answer is desperate prayer, the largest leap human imagination can make. "Vespers" makes a similar terrible beauty from this experience with Rollender's characteristic leaps and turns, as well as vivid imagery of the body broken. 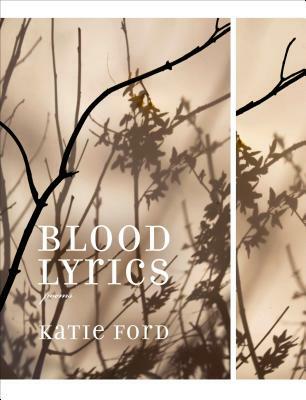 In contrast to Rollender's leaps and turns, Katie Ford's small, tight poems step with cautious care from one line to the next. In the first section focusing on her premature daughter's uncertain fate, this cautiousness is held in tension with utter desperation, and that makes her poems vibrate. In "Of a Child Early Born," Ford writes, "For the child is born an unbreathing scripture / and her broken authors wait / on one gurney together." In the first line, "the child" isn't even theirs and isn't even a child but "an unbreathing scripture." Readers take in this line and then, in the next one, learn that the parents, too, are not parents but "broken authors" who wait together, as her readers wait at each break, for the poem to dispense its terrible information. Each line delivers a blow by feeding us one image at a time, and each image shifts slightly our understanding of what is happening and its emotional effects. Ford alternates between "and" to connect fragments of her experience and "but" to emphasize opposition or reversal. Her use of these conjunctions makes the illogical feel strangely logical, controlled. However, because her prayers seem equally likely to bring "God or demon," the only response is "to lie still, play dead," an ultimate position of helplessness. In Ford's hands in this and other poems, her newborn daughter's slight hold on life seems the makings of a fickle, ancient force that might be called in prayer or supplication or warded off―if only she knew the right spell or ritual. After establishing the hardship that should define the lives of citizens whose country is at war, Ford turns to point out how, for Americans in the U.S. like herself, cursed is far from the reality where "our horses ripple their flanks / and the orange grove shakes green in the warm wind it loves" in a land of abundance and ease. The curse, then, is failure to acknowledge the death and destruction that are the real consequences of war. Distance is the most sickening luxury of all. Line breaks force us to read this thought more slowly, emphasizing the words at line ends: "we must not / have heard / their music." This new emphasis itself creates a different music, and in that new music we hear Ford struggling to convince herself how we could kill real people already "under constant death bells / ringing over sleeping cribs and dry wells." In "From the Nursery," appearing alone in the final section titled "Coda," Ford states directly the argument of her entire collection: "When I looked up from her hospital crib / to see a wider world, could I help it / if I saw a war?" Her experience as a mother of a premature baby whose life swung so uncertainly between life and death radically alters Ford's vision of the world outside the nursery windows. Her vision of a war that before seemed so distant as to be nonexistent is transformed by new motherhood into an uncountable number of threatening and brutal acts that end human lives, acts for which she bears some responsibility. It’s a bold move to end by slinging their own mothers to answer those who criticize motherhood as way of knowing. However, this decision speaks to what all three of these collections teach us, their readers. Motherhood does indeed create many ways of knowing. Skolfield shows readers what we can know through play and exploration "because / it's a new day, isn't it, and anything can happen." Rollender shows readers that we can know through leaps of association and prayer, trying "to catch God / whole" while "the dead finger door knobs / because they can't forget." Ford shows readers that love's intensity can carry us beyond logic and back to know through compassion. And that compassion might be the strongest weapon to fight "each hibernation, / each lightly drugged feather, each stun and lie." Ultimately, though, these ways of knowing are powerful and beautiful but still guesses. Any poem worth reading brings to bear on the world and human experience a kind of attention whose insights are, in the end, unsummarizable. In answer to questions like my daughter's unanswerable ones, these poems flash more terrible and lovely versions of my own guesses. But it's the asking and guessing that is most important. It's our job―as parents, as humans―to keep wondering and guessing. The power of reading poetry is that it keeps us doing just that.